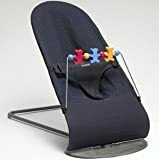 Baby bouncers – baby seats that spring or bounce as the baby sitting inside moves – are becoming increasingly popular with parents. Baby bouncers, probably by simulating the movement inside the mother’s womb, soothe babies and keep them calm, and help to lull them to sleep. While baby bouncers with basic designs are available, the more expensive models even go up to $ 300. Below is a comparison of some popular baby bouncers. 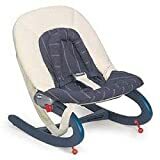 More of a rocker than a baby bouncer, it includes two melodies to help soothe your baby to sleep. 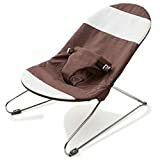 This bent Birchwood baby bouncer with a fully adjustable recline also allows you to rock your baby with a tap of your foot. Bentwood backrest supports baby’s skeletal system. Features three loops to attach toys (not included). Along with an adjustable three-position recline, this baby bouncer also has a toy bar with wooden bears to keep your baby happy. This baby bouncer is simple yet stylish design, with a steel frame and cotton seat. This ensures that it fits in well with any grown up décor.